The centre stone in this very pretty engagement ring is an oval brilliant cut diamond, GIA certified as G colour and VS1 clarity which is quite a rare stone. But what really makes this ring unique is the pink diamond halo surround. Natural pink diamonds are exceptionally rare but we have managed to obtain a small selection of natural baby pinks and have used some to enhance this beautiful ring. 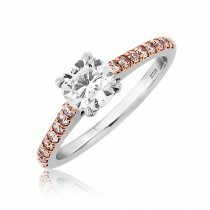 Each pink nestles in a rose gold setting of its own while the rest of the ring is made in hard wearing platinum. The design, which incorporates pavé set diamond shoulders, is a modern interpretation of a classic cluster dress ring but we have made it as a subtle wed fit so that a straight wedding band can be worn alongside.